Last year I blogged about the Beauty and the Bike movie. Now there is a summary film from the project giving a little information about what has happened since the film was released. From the Beauty and the Bike blog: "The excitement of the film premiere is over. Back we go to “normal” life in Darlington. We’ve managed to keep the beautiful dutch bikes – in fact we’re going to buy 40 more this year and expand the bike hire scheme. But how many girls will keep on cycling? We know that cycling is still “uncool” for many UK teenagers – perhaps because it feels so unsafe on our meagre infrastructure? Here, one of the girls from Beauty and the Bike, Lauren Pyrah, comes behind the camera to ask what is happening to the Darlington girls now. Kate, one of the original group, is joined by Francesca to shout the praises of everyday cycling. But Ashley has stopped. Why? And will politicians listen?" 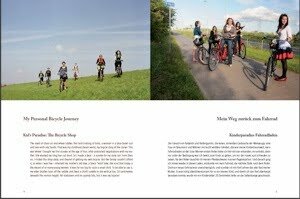 The film and its accompanying book (which explains from the point of view of Beatrix Wupperman about the difference between her youth in bike friendly Bremen in Germany and the experiences of teenagers in bike hostile Darlingon in the UK) are essential reading and viewing for campaigners, especially in English speaking countries, all of which share much the same problems as the UK. Between them, they offer an exceptional insight into why it is that teenagers in the UK predominantly don't cycle. Teenagers who don't cycle mostly turn into adults who don't cycle. And of course while girls and women in Britain are even less likely to cycle than boys and men, the same issues also prevent males in Britain from cycling to any significant degree. The book and video are both available from the Beauty and the Bike website. These are exceptional pieces of work and I really can't recommend them highly enough. As they say on the website: "It's the infrastructure, stupid." I'm in the film for a few seconds and so is one of my daughters. In a story which sounds implausible, but is actually true, The Fietsberaad reports on a cycle only tunnel in Apeldoorn which detects the sound of mopeds, photographs their number plates and automatically fines the riders. For cyclists, this is much much better than any sort of anti-moped gate. "This is an approximately 90 metre-long underpass connecting Apeldoorn-Noord and Apeldoorn-Zuid. There are sunken squares on either end of the underpass. The underpass is an integral part of the station environment. The reason for barring mopeds is local authorities’ fear that the large differences in speed may cause dangerous traffic situations. In addition, the resounding mopeds sometimes scare other traffic participants stiff. Moreover, this is an attempt to reduce nuisance for residents on the approach routes. There are plenty of alternatives, anyway. 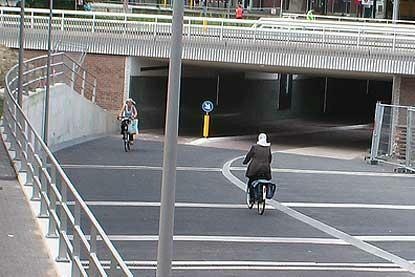 Mopeds may also use the underpasses meant for cars. This is the first time this type of system is employed." The system is intended to increase social and subjective safety of cyclists. In general, small mopeds, known as bromfietsen, are allowed to use rural cycle paths but not urban ones. This is actually beneficial to cyclists as it requires that rural cycle paths are designed to accommodate the 45 km/h legal speed of bromfietsen. Access to paths where they are not allowed is generally not enforced by any kind of infrastructure such as gates. This enforcement using a camera is quite novel. I wrote before about how, around here at least, I don't find these bromfietsen to be any problem at all. They are not as common here as in some Dutch cities, and they're generally ridden very carefully. "Over one-third of the U.S. population is under age 16 (cannot legally drive) or over age 65. Streets designed just to move cars are leaving behind the most vulnerable road users, often making them prisoners in their homes or completely reliant on others to drive them around. Less than half of states and major U.S. cities have adopted complete streets policies that require that roadways be designed and built with all users in mind." 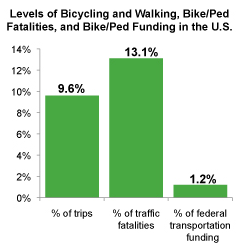 - So says the Alliance for Biking and Walking 2010 Benchmarking Report. "States with the lowest levels of biking and walking have, on average, the highest rates of obesity, diabetes, and high blood pressure. In contrast states with the highest levels of biking and walking have, on average, the lowest rates of obesity, diabetes, and high blood pressure. In addition, where rates of biking and walking are greater, more of the adult population is likely to achieve the 150 minutes of weekly moderate-intensity aerobic activity recommended by the Centers for Disease Control and Prevention (CDC). According to CDC, physical activity can reduce your risk of dying early from the leading causes of death, like heart disease and some cancers." Progress is only possible with continued funding. Sadly, the Cycling Embassy of Denmark reports that funding for cycling in Denmark has been cut. Today was the Sinnerclub ride in Groningen (more photos here). Peter and I decided to go and join in, at least for a bit. The ride started in a village called Eenum, which was a 58 km ride from Assen. When we got there we found about 15 people (I didn't count heads) just about to leave for their own 60 km ride. We only stayed with the group for a short distance as we'd decided to ride past the Sinner HQ in Garsthuizen and visit Jan and Harma de Vries who run the company. Jan Eggens made a video of the ride, which without us continued up to the North coast of the Netherlands. It was a great ride. Through lots of tiny villages, many with huge churches, past lots of windmills, over lots of bridges. This is the "Peertil" bridge. Jan warned us not to take this route as the bridges were not entirely velomobile compatible, but we mis-read the map and ended up here anyway. Most bridges on cycle paths are no trouble at all, but this one is an historical monument, originally built in 1754, and still resembling the original design. It pre-dates velomobiles. The name is a corruption of "Horse Bridge" - and it was originally built to allow horses over the canal while boats went underneath. We used it to test our parking brakes. Anyway, I took other photos, but none particularly worth seeing. The ride was great fun, by the time we were home we'd covered just over 130 km in a total of 5 hours riding, not all of it very quickly - such obstacles as these bridges took some getting around, as did heading back to Assen into a 30 km/h headwind. Overall, a very pleasant way of rounding up the national recumbent weekend. I mentioned a few days ago that this weekend is the national recumbent bike weekend in the Netherlands. Contemporaneous with this, there's a slightly worrying story from Australia. Apparently there is a proposal to make all recumbent cyclists in the country have a flag on their bikes in order to "increase regulation and legal compliance of human powered vehicles." As the linked article notes, "this proposal appears to be based based on spurious and anecdotal experiential demand." Australia is already one of the very few places where cycling helmets are compulsory, and this is another step along the same lines. The message would seem to be that "cycling is dangerous". It's a mystery to me why Australians, who to much of the world seem to have rather a "rugged" reputation should seemingly be scared of bicycles and leading the world in such scaremongering. However, Australia's cycling rate is one of the very lowest in the world, so if the intention is to marginalize cycling then I guess it's working. Bicycles are in themselves extremely safe. It is automobiles which kill as many people as wars, not bikes. Recumbent bikes may actually be rather safer, in that falls are often from a lower height, and if you fall, you usually land on your backside. In the case of a velomobile like my Mango, you're completely surrounded by a shell which protects in the case of a crash. I'm not aware of any real evidence that recumbents are less visible than other bikes. Indeed, my experience on first riding one on the roads in the UK was that more drivers noticed me, and these would give me more space on the road. Sometimes dramatically more space. I certainly don't believe that my 2.5 m long bright yellow Mango would be more visible if only for a 15 cm long flag, and my brief experimentation with a flag on a two wheel recumbent (in the photo above) lead to a conclusion that from behind, the flag was the least visible part of the bike. I don't believe that there is actually any reliable evidence one way or the other about relative safety of recumbent vs. other bicycles, so punitive laws against a particular group of cyclists are difficult to justify. It's issues like this that require cyclists to behave as a whole. It does no good for different "tribes" to develop. It's no good for racers to disregard the interests of mums with kids on bikes, or for "slow cyclists" to distance themselves from sport cyclists. Indeed, it doesn't even help for cyclists to distance themselves from drivers. If we're to see a dramatic increase in cycling around the world, people who drive now are future cyclists. These kinds of issues affect everyone. "Them and us" helps none of us. The photo is of my old Pashley PDQ on the top of Shap Fell, part way along the one tour when I did use a flag. It was less visible than the basket. Of course, if you prefer to ride with a flag, that's your own personal choice. Good luck to you. Yellow school buses for Britain again ? I covered two year ago how the Yellow School Bus Committee in the UK wanted to introduce US style school buses. This organisation was established and sponsored by a bus company, and it was quite obvious that they would benefit from the proposal more than children riding in the buses. Now the CBI (Conferederation of British Industry) is at it. They "want to see more use of US-style yellow school buses to cut school-run congestion." Apparently "the average length of journey to school for 11-16 year-olds rose from 2.8 miles in 2000 to 3.4 miles in 2006... It is estimated that 12% of school pupils would use such a service, which would eliminate 130 million car journeys a year (saving 55,000 tonnes of CO2). This would cut rush hour car traffic by 2.6%." That's right, this again has nothing at all to do with making children's lives better, but they'd like to see children kept out of the way of important people in cars. Here in the Netherlands, children quite routinely make much longer journeys by bike to get to school. They can do so because of the infrastructure. Where are the calls for similar infrastructure in the UK, reducing dependence on motor vehicles by increasing the directness of journeys and the subjective safety for cyclists, and giving children a greater degree of freedom ? If the CBI really is concerned about the cost to business due to congestion then why don't they really, seriously, try to encourage more cycling ? If cycling in Britain reached Dutch levels not only would it save British businesses 2.5 billion pounds per year, but it would also do a lot more for the environment than the CBI's motor vehicle oriented "low-carbon transport roadmap," in which the only mentions of changes to infrastructure are in terms of charging stations for electric cars. Yes, it seems they really do believe that the problems caused by cars can only be solved by more cars. Freewheeler covered this story from a different angle. We've three excellent events coming up in the next month. First, on the 27th and 28th of March (i.e. my Birthday weekend !) there are the Dutch National Recumbent days. Second, on the 31st of March is a really huge event. Heel Nederland Fietst is a three year round of cycle promotion which has just started. On the 31st there is an attempt at a world record for the largest number of people ever to have taken part in a simultaneous bike ride. The idea on this day is to get the entire population, or as much of it as possible, to ride a bike for at least half an hour between mid-day and one in the afternoon on Wednesday 31st March. Thirdly the Northern Recumbent try out day is here in Assen on the 11th of April. It's just over a kilometre from home, so I'll be there. Cycling promotion never ends. While there is a lot of cycling already here in the Netherlands, there's still not enough. On the 15th of February, the day these photos were taken, it was -8 C in the morning. However, as you can see from these photos of cycle parking at a local school, Dutch school children cycle whatever the weather. This cycle park has more than enough space for every one of the 700+ students to park a bicycle, and very nearly every student arrives at school each day by bicycle. Yes, that means even on the coldest days, and includes children who live so far as 20 km from the school. I met my youngest daughter from school, a little earlier than usual, and we rode home together. I'm happy to say that it's warmed up a little now, and we're seeing temperatures above zero even first thing in the morning. My daughters again headed for school by bike this morning, just like everyone else. Also see what happened at this school when they held a school triathlon. Tonight I watched the Tegenlicht documentary De Regenmakers, a very interesting programme about the growth of environmental activism in China, focusing on four activists. One of the people featured was Zhao Lei in Beijing. She was protesting against the pollution due to a local incinerator, but the footage included video of the quite remarkable traffic jams now commonplace in the city. This reminded me that I was going to write about what has happened to cycling in China. It used to be that when talking about the cycling rate of the Netherlands we had to explain that it was first in the world only if you disregarded China, which was a special case. However, that's now changed. As The Guardian pointed out a few days ago, "Twenty years ago, four out of five residents in the Chinese capital pedalled to work through one of the world's best systems of bicycle lanes. But the modern passion for cars has made two-wheeled transport so treacherous, dirty and unfashionable that barely a fifth of the population dares to use lanes that are now routinely blocked by parked cars and invaded by vehicles attempting to escape from the jams on the main roads." The thing is, cycling in China was never motivated in the same way as cycling in The Netherlands. The Chinese cycled out of necessity. They could not afford cars, and perhaps they weren't available to buy even if they could afford them. This has changed, and a generation who wanted a car but were forced to cycle went and bought cars. The Netherlands is a completely different case. The rate of car ownership here has not climbed at the same rate as in other countries in large part because bicycles offer such a pleasant experience and a convenient way of getting about. The result is a very high discrepancy between the rate of car ownership and car affordability vs. other comparable countries. i.e. more people make a positive choose not to own a car here than anywhere else. Even Chinese news sources now recognise the problem in China: The first concern is safety of cyclists as bicycle lanes have been edged out or phased out and bikes must use faster and more dangerous auto lanes. i.e. A lack of subjective safety is also working against cycling. And this is what Beijing looks like today (there are plenty of other videos on youtube, including this one showing the technique for making a left turn by car). Roads have been built on an epic scale, favouring cars even if they don't really provide much in the way of convenience. Some people do still cycle, but in conditions like this they probably wish they had cars too. Does this really look like progress ? Why do Sydney's drivers hate cyclists ? The Sydney Morning Herald from Australia recently reported that Sydney is "the city that hates bikes." Cycling rates are low all across Australia, but Sydney is the city which has "the lowest rate of bicycle ownership of any major city in Australia as well as the lowest proportion of people who cycle every day." Melbourne has double the cycling rate of Sydney, with 2.1% of commutes by bike vs. 0.8% in Sydney. John Pucher, who I wrote about previously, spent a sabbatical year researching ways to boost cycling in Sydney, and wrote a detailed report which looks into the reasons why Sydney has so little cycling, making comparisons with Melbourn and with the rest of the world. 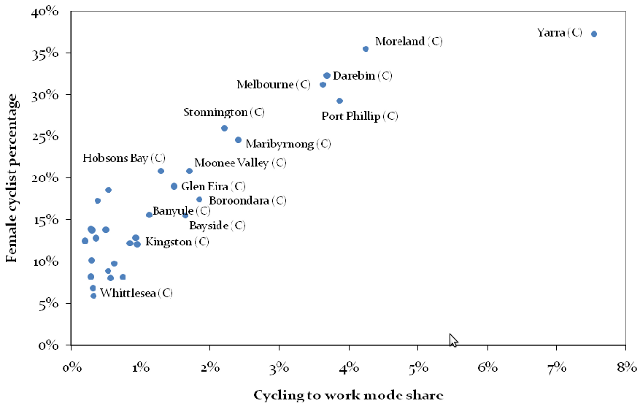 The graph shows the relationship between the bicycle modal share for commuting and the proportion of bike trips which are by women for various areas of Melbourne. Women are typically more cautious than men, and where subjective safety is lacking, fewer women will cycle. It is noted in the article that cycling rates for women are very low in Australia, while the highest rate of cycling by women is here in the Netherlands where 55% of all cycle journeys are made by women. Normally I would note here that the commuting rate is usually a lot lower than the modal share for all journeys. This is true in most instances because children, parents with children and the elderly are even more affected by subjective safety issues. However, Australia's cycling rate is so low that other effects come into play. In Sydney, fully 53% of cycle journeys are made for recreational purposes. This is quite an unusual situation. Conditions are such that utility cycling by "normal people" who don't identify themselves as "cyclists" has almost been eradicated. Pucher's article (please read it) spends a lot of time looking at the factors which make cycling particularly unattractive in Sydney. Topography and climate, population density and urban form, trip distance, socioeconomic and demographic factors. I've covered most of these issues before, and none really add up to a reason for no-one to cycle. I've covered these excuses before, so I won't go over them again, except for one. The problem of trip distances is so commonly over-stated that I will write about that. The average work trip length in Sydney turns out to be 16.9 km. That's quite a high figure. However, 32.9% of work trips are actually under 10 km, and 15% of trips to work are under 5 km. Even with such a large number of short commutes, only 0.8% of all these commutes are being made by bicycle. Journey distances may put off some potential cycle commuters, but they are clearly not the real reason for the cycling rate of Sydney being so extraordinarily low. It is often believed by people from low cycling English speaking countries that the Dutch only make short journeys. That of course is not the truth. Across the whole of the Netherlands, 35% of all trips for all purposes that are under 7.5 km are made by bike. So are 15% of journeys between 7.5 and 15 km and 3% of journeys over 15 km. The Dutch have the longest commutes on average of any nation in Europe. "Concern about the danger of road cycling is a serious deterrent to getting more people to cycle—especially for children, the elderly, and women, but also for anyone who is risk averse (Bauman et al, 2008). A recent survey of 1,150 Sydney residents living within 10 km of the CBD suggests that perceived traffic danger is the primary reason why non-regular cyclists do not cycle more often (City of Sydney, 2006). Thus, improving cycling safety is an important approach to encouraging more cycling among a broader cross-section of society. Of course, reducing cyclist injuries and fatalities is an appropriate public health goal in itself, but the potential impact of improved safety on people’s willingness to cycle is yet more reason to pursue this goal." There you have it. There is a lack of Subjective safety. It doesn't have to be like this. In the Netherlands we have infrastructure which supports cyclists by giving them direct journeys with a high degree of subjective safety making cycling easily accessible to all. 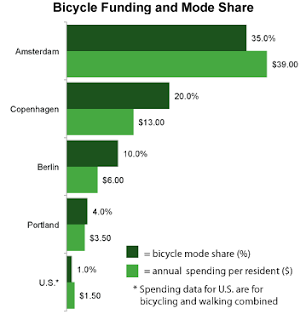 The result is not only an enormous difference in the number of short and slow journeys made relative to other countries, but increases interest in all types of cycling. You also see it reflected in the very high rate of participation in racing, and the resulting success in international racing vs. other countries, and the high rate of long distance cycle commuting. The latter particularly benefits due to infrastructure specifically designed to support it. The quality of Dutch provision has made a great difference to my own commuting speed. For keen cyclists, there is no down side to the type of infrastructure which exists in the Netherlands. 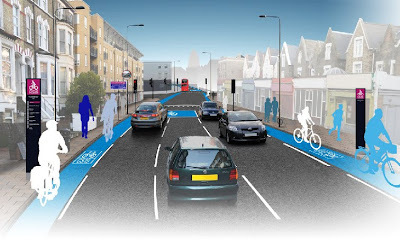 The story about Sydney came to me via the Crap cycling and walking in Waltham Forest blog. On the 6th of March, the 50th edition of the Ster van Zwolle race was held a few km south of here. 29 teams of 6 riders raced 170 km a few km south of here. I'm not sure what the temperature was on the day, but it certainly wasn't warm (it's -6 C now and it has snowed lightly over the last few days, though thankfully Saturday wasn't the coldest day). Our local TV station put this clip on youtube, showing the 20 year old Assenaar Bert-Jan Lindeman winning the race at an average of 40.8 km/h. Fantastic. Well done ! Note that he's riding a Gazelle. This is a very famous Dutch bicycle manufacturer, who make a great variety of bikes, and not just the sit-up bicycles they're perhaps most famous for around the world these days. I worked at the ligfietsgarage on Saturday, but really ought to make an effort to see more of the many racing events held around here each year. Cycle racing is incredibly popular here, both to take part in and as an event to watch. Rotterdam is introducing a new kind of "Green Wave" for cyclists, called "Evergreen". The new infrastructure should be in place by the summer, and will feature in publicity surrounding cycling when the Tour de France starts in the city. Where green waves exist they dictate an efficient speed. Whatever speed is chosen by the designer, almost all cyclists will actually be either faster or slower than the chosen speed so they will be penalized and forced to stop. Stops cost cyclists a lot of their efficiency. Traffic lights exist in order to resolve problems caused by motorized vehicles. 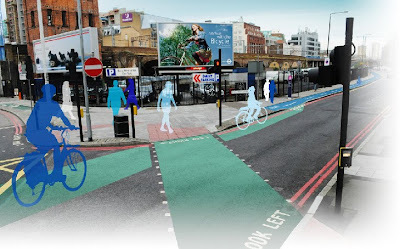 They affect cyclists only when their routes are the same as the routes taken by drivers. It's frequently possible in the Netherlands to make shorter journeys by bike and avoid traffic lights altogether due to the unravelling of bicycle routes from driving routes. Green waves for cyclists are rare in the Netherland and we don't have any in Assen. Frankly, I don't miss them as we have better infrastructure than this. We have the very first Wandertec Bongo trailer in Europe. Ours is the "small" size trailer, which weighs just 6.5 kg (14.5 lbs) and has a load bed size of 63 cm x 38 cm (25 inches x 15 inches). The Bongo makes a surprisingly lightweight package. All the parts arrived in one cardboard box. The light weight is in part due to the frame being of aluminium. It also makes for a very rigid construction. The wheels are radial spoked, 16 inch (ETRTO 305) size. which looks nice, have aluminium rims and hubs, and spin very freely. The trailer uses the well established Chariot trailer mount. We already have this on other trailers, so it means we can swap between bikes easily. Earlier I showed how I retrofitted this hitch to our dog trailer. The wheels mount and unmount simply by pushing in the centre of the hub, which makes a locking mechanism withdraw. It took just a few minutes to assemble the trailer, but it was a couple of weeks before I got around to using it ! Note that the load bed as supplied is not the maximum size which will fit between the wheels. The trailer comes with straps which can be used to attach many different shapes to the top, but I will make a slightly oversized basket to fit between the wheels and carry more things conveniently. More later when we've had a chance to get more use from the trailer ! 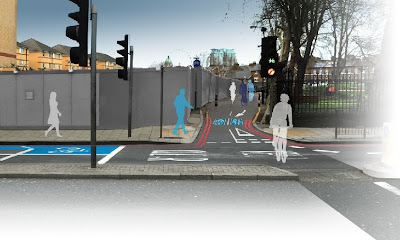 This shows a cycle path which is too narrow and has inadequate separation from the road. Our local standards call for a minimum of 2.5 m width for single direction cycle paths with 1.5 m separation from the road. For two direction paths, 4 metres is required. It looks like this. We're also not shown how this integrates with junctions. Something like this would be better. This is again rather too narrow, and has an "interesting" turn left or right for cyclists wanting to go from the advanced stop box onto the cycle path. Left they've got a 90 degree bend, right there is a small island in the middle of the street. Cyclists in the UK quite often have problems with buses, and cycling in bus lanes in Britain can be a thrilling experience. 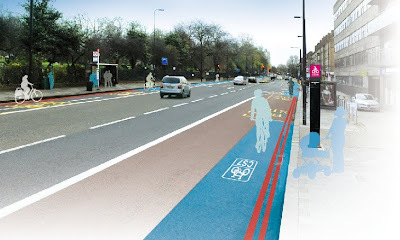 A bus lane is not a "cycling superhighway" even if there is a blue stripe in it. (Over here they keep you away from buses for good reason, even when there are works on the cycle path). PRESTO, a European programme to encourage cycling "For everyone as a daily transport mode" specifically recommends against combining buses and bikes. 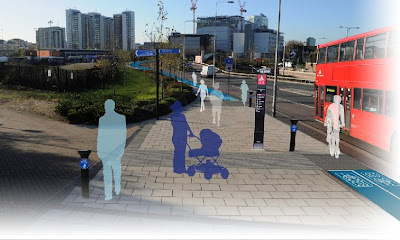 This cycle path disappears and reappears on the pavement, and gives cyclists an opportunity to collide with bollards. Again it's much too narrow and inadequately separated from the road. Extremely narrow cycle lanes, complete with railings on the pavement to make any collision with motor vehicles even more lethal. Narrow cycle path gives way to side road. Over here you generally have priority over side roads. See the first link for examples in the city, and this link for the countryside. Narrow on-road lanes with confusing overall design. Also note the extremely narrow width of the pavement used by the blue pedestrian on the left. However, there is still room for three lanes for cars. 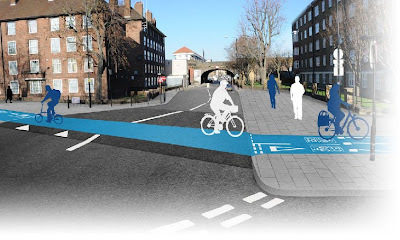 Immediately after negotiating the crossing, cyclists are supposed to hop up onto the narrow blue part of the pavement by turning at exactly the right time on a very short piece of dropped kerb. A junction at which cyclists may well have to stop more than once to get across. It doesn't have to be like this. 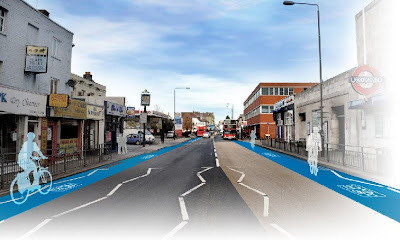 Merely putting blue paint on low quality infrastructure will not result in a boom in cycling. The majority need cycling to both feel safe and be convenient before they will take part. There are many much better examples which London could try to emulate. 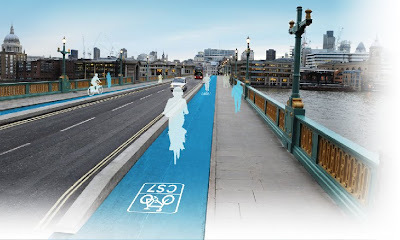 For more on the London "superhighways", click here. 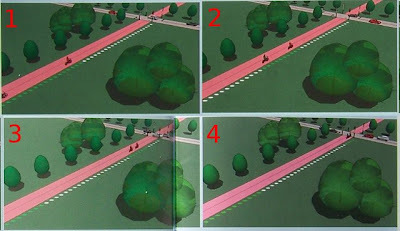 This video, from the fietsberaad, isn't too clear, but what it shows is quite interesting. It's an experiment with dynamic cycle path lighting. The lights remain at about 20% brightness until a cyclist approaches, when they will increase to full brightness as the cyclist passes, reducing again over several minutes if there are no more cyclists nearby. 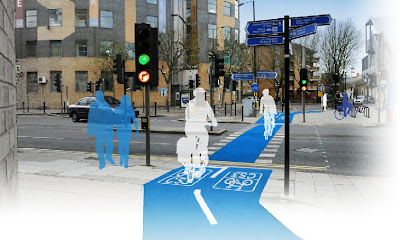 The idea is to retain a high level of social safety along cycle paths while also reducing the energy usage and light pollution which would result from full brightness lights at all times. These experiments do, of course, also use LED lighting to further reduce the energy demand, and they are soon to appear more commonly across the country. There are further stories about lighting, which include some other experimental schemes.